A perfume decant is essentially a smaller sized vial or bottle of perfume that is not a manufacturer's bottle, nor is it factory sealed. All of our perfume decants are hand poured from the original manufacturer's bottle into bottles liked the ones displayed below. We also often secure the bottles with electrical tape to help prevent minor leakage if the spray did not screw on or fit quite as tightly as it should. Decant bottles are not meant for long term storage as they are not manufacture sealed. Putting a piece of electrical tape, if your bottle did not come with some, around where the atomizer or cap meets the bottle can help keep your fragrance longer and safer from evaporation. You should check it often. Why would you want to get a perfume sample or perfume decant? Oh, hop on over here and let me explain it! And then Sign up for our Newsletter! where we actually send you information and news about perfume, tips, along with great deals, specials, discounts, drawings for FREE stuff! These are the size representations for all perfume decants sold in the store with the fill line indicated in the photo. 2ml glass spray (does not have a cap) - great for testing if you prefer a spray, and we do recommend spraying perfume as a part of the sampling process since dabbing or spraying often produces different results. You get approximately 30 sprays from this bottle, so it's enough for a few trials, depending on how heavy your spritz finger is, but this is not a long-term storage solution for a beloved perfume. Please don't count on this little bottle to keep Vintage Mitsouko intact, without evaporation for months/years. 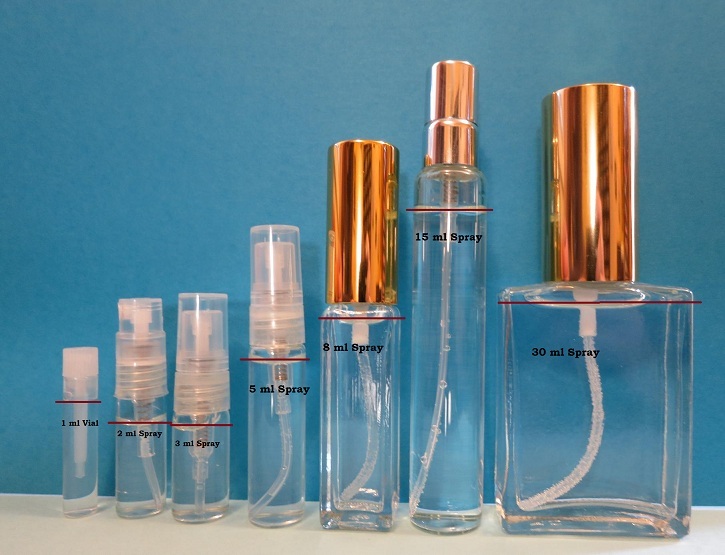 It is not designed as a permenant storage solution, only as a way to test/sample perfume. 3ml glass spray - a little less than 1/8 oz (which is 3.75mls) - you get approximately 43 sprays from this bottle. Again, as with the 2 ml bottle, this is not a permanent storage solution for your perfume, the bottle is not designed to be leak-proof and evaporation proof for months or years. It is only designed to keep perfume long enough for you to try it a few times to see if you like it. 30ml - 1 oz. This size is perfect for those mondo-size bottle releases like Dior, Creed or Tom Ford does. Because we do buy the large bottles and have different pricing, we can often provide you with a 30 ml spray for less than you can buy a 30 ml bottle for, if one is available.